The Daddi Long Legs™ consists of stainless steel wires, which extend out from a plastic Delrin base. The wires rotate freely in a light breeze, or if the bird comes into contacts with them. 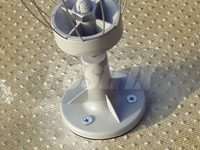 The revolving head can be very easily removed from, and then replaced onto, the fixed base. This makes the Daddi Long Legs™ an ideal product to protect structures that require regular maintenance, such as air conditioning units, the tops of silos, street lights etc. The tips of the wires should be bent so that they are no more than 50mm (2”) above the surface, or overhanging the edge, of the structure being protected. They should be able to rotate freely. The wires must extend out over the edge of the structure being proofed, or overlap if multiple Daddi Long Legs™ are being placed on the same structure. The base of the Daddi Long Legs™ can be glued or screwed into place. Make sure you will not damage the equipment when drilling holes through it. Air conditioners and lights often have sensitive equipment near to the top surface – look inside before drilling. Drive self-tapping screws through the three holes in the base. Note: Do not use the adhesive gasket to secure the unit in place. The gasket is provided only to keep water from entering through the screw holes. The base of the Daddi Long Legs™ cannot be glued directly. You will need to attach it to a Surface Mount Base Adaptor. Prepare the area to be glued, ensuring it is clean and free of loose paint, rust, bird droppings etc. 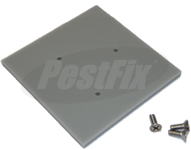 Screw the Daddi Long Legs™ base onto the plastic base adapter using the screws provided. Apply a zigzag pattern of adhesive to the bottom of the base adaptor and press firmly in place. The top part (which contains the twelve wires/legs) can be removed from the back base and spindle by pulling it upwards. When putting it back together, make sure the locking disc is forced up inside the top with a screwdriver.